I met my two best friends in the 6th grade. I will never forget our first interaction together. Jenny and Kelly had already been friends since they were itty bitty, and I came later. I can honestly say that we had almost nothing in common, but we managed to hit it off right away…well not right away. Kelly and I met through our families who happened to share a mutual friend and vacationed together. We were also both cheerleaders. Kelly because she looked hot in those teeny skirts and me because I could lift 100 pounds above my head without a sweat. Let me paint a little picture of the three six graders we were. Needless to say, I grew on her; she has been by my side for every major event in my life. There is a bond between the three of us that nothing can break. To this day, we are all completely different people, in different places in our lives, with different believes but with one thing in common. We all three love each other unconditionally. The best way for us to have expressed this love was via our high school rings. Well, I can think of a dozen more practical, less expensive, more fashionable ways not but in 1999, this was our way! We were all three about to go to separate colleges. Kelly got into UGA (brat! She was hot and smart), Jenny decided on West Georgia and I opted for University of Tennessee (Go Vols!). 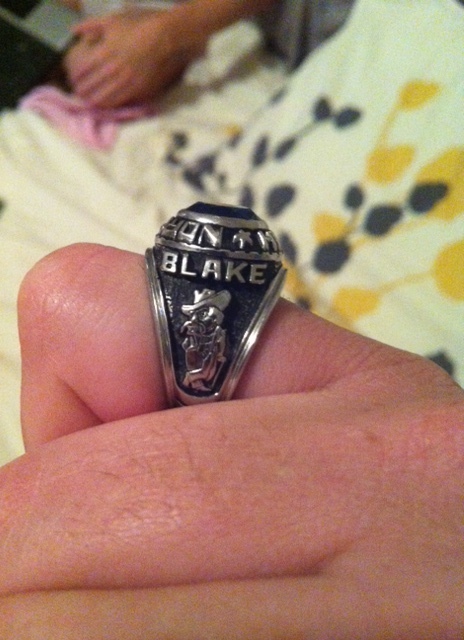 We knew we could stay connected with our high school rings, and we would wear them FOREVER or at least until the middle of the summer after our graduation. For me, this was actually an accessory upgrade. Jenny, Kelly and I decided to have “JKM” engraved on the inside of all of our rings. The cool thing about these rings is how personal they could be. Anyway, the whole point of this story was to lead into this delicious recipe that Kelly’s mom introduced to us. Jenny and I call Kelly, Fankee (long story-whole different blog post). Her mom made this pasta for us one night when Kelly was visiting from NYC. Jenny and I absolutely fell in love with it. Her version is vegetarian, yet another example of our extreme differences (Exhibit F- Beef section of the blog). I like to add chicken or shrimp. It can be pricey so here are my tricks to bring down the price. – Get the pine nuts from Costco. You will have a ton of them but they are so good to add into pasta, quinoa, salad, casseroles, etc. – Get 10oz of spinach from the grocery store ‘price by weight’ salad bar. It is light and is about half the price as the spinach in the salad section. – Since you use the entire container of feta, get the ones that are marked for quick sale. They normally do that when they have three days before sell by date and you will use it all that night. My Saturated Fat Costs How Much?!?!?! Needless to say, against Blake’s pleading for me not to, I told the kind lady that we would like to cancel our order, and I moved onward to the next saturated fat jungle. Blake gets so mad at me when I change my mind on things at the last minute based on price. The one that makes him the most mad is when we decide to shop at Whole Paycheck Foods. I absolutely love Whole Foods. I love the way they set up the produce with such design and pattern. I love the crushed ice where the fresh fish are displayed, I love the free floating wine selection, and I love the olive oil tasting bar. Not to mention, the deli guys always seem to be incredibly good looking with their tattooed forearms and wide ear piercings. For all of these reasons, I always find myself loading my basket and heading toward check out. It is almost guaranteed that every time I round the corner past the salad bar and fresh baked breads, I begin doing the grocery cart math in my head. $5 for this plus $8 for this plus $17 for this plus $3.50 for this…… $75 for one meal! Blake glances over and sees the color in my face quickly fading. Instantly, he takes the cart, begins putting all of the collected groceries back on the shelves and tells me he will meet me at the car. Off to Kroger we go. One day, one of the women on my tennis team told me about Luciano’s, a small yet elegant Italian restaurant near my house. I was anxious to go. Blake and I walked up to the door and it looked beautiful. I opened the door and saw the dreaded white tablecloths. Don’t get me wrong, I love white tablecloth restaurants, but not with my 3 year old who has no concept of volume when speaking. In the corner of my eye, I noticed a take out menu….Bingo! Blake went in and ordered us two sandwich and sides, and we waited to pay. “That will be $16.16” the beautiful and polite hostess said. Being that there was no static to interfere, I simply assumed she had not done the math correctly. I asked her if that total was correct and she printed me a receipt showing me that she had in fact computed the total correctly. Here I stand in a beautiful restaurant with an open grill, granite top bar, fresh herbs growing in the foyer and chefs in white coats, paying $4.00 less than I would at Wendy’s. This little experience led us to the creation of our dinner last night. 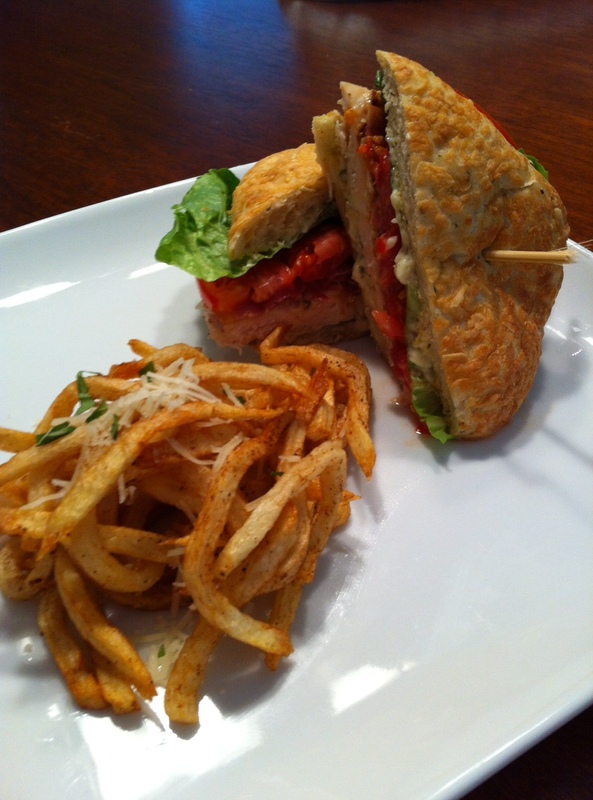 Luciano’s makes an Italian Chicken BLT. It is on Ciabatta bread with a pesto aioli and pancetta instead of regular bacon. They serve it with house made truffle and Parmesan potato chips. Blake recreated it last night with home cut truffle french fries. It was amazing! Pasta salad is just an easy, versatile and well-liked food. Personally, I like the oil based pasta salads over those that are based in mayonnaise. Pasta salad would be such a fun thing to make for party, but the delivery of it is such a hassle. You either need a bowl or a plate and a fork. You basically have to be sitting at a table or the pressure of the fork on the plate while its being supported by only one had can end up in a disaster on the entertainer’s floor. 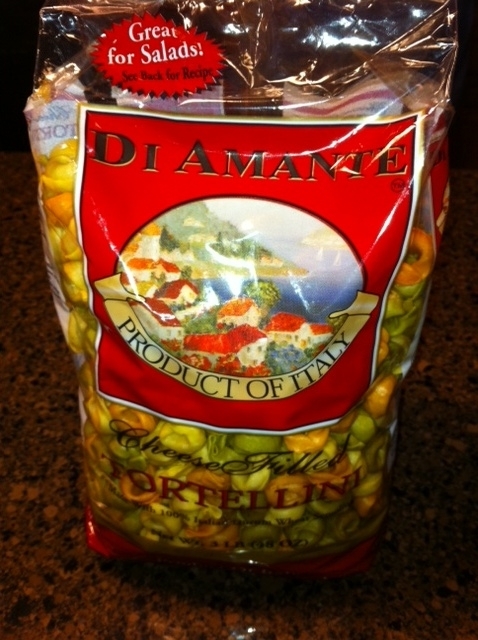 As I was shopping at Costco, I found another “must share” deal: Three pounds of dry cheese tortellini for $5.99!!! I knew I had to have it. Lottie eats it for dinner with butter and parmesan, and I love it in a salad. After buying this great deal, I was determined to find a way to make tortellini pasta salad easy and accessible for a party or a tennis match. 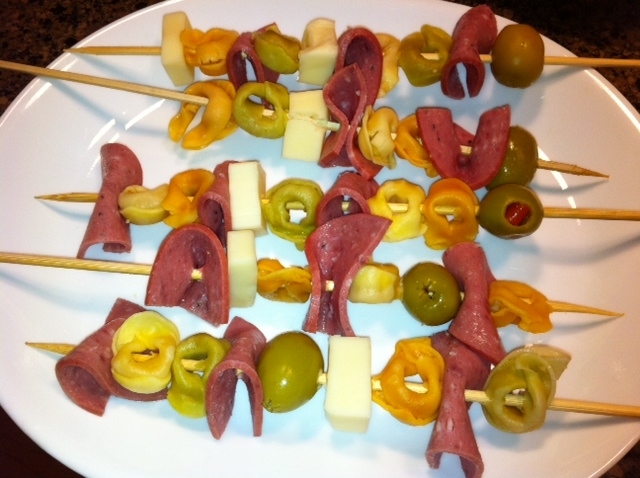 I decided to go with Antipasto Salad Kebabs; easy to eat, simple to prepare, inexpensive to make and taste wonderful! Happy Eating! Cook pasta as recommended on package. Jones Bridge pool is one of my favorite places within the Georgia state lines. I became a member when I was a baby, and spent approximately 50 hours there a week until I was 16. Last year, Blake and I were looking for a community pool to join so that we could establish some new friends with kids for Lottie as she was getting a little bored of watching Blake play video games and grocery shopping with me. I knew that Jones Bridge was going to be place we were going to join. From the second I made the decision, it was as if my Barracuda fins instantly grew back in. The coolest thing about this pool is that you don’t know a stranger there. Everyone talks to everyone whether they have been introduced or not. In fact, I have met several friends there that I was never introduced to…we just started talking. It just feels like home when I walk into the gate. This summer Blake and I have been grilling out a lot. The other night we decided to grill at the pool. We ran through our options…steak, chicken, fish, veggies…. I was simply bored with the choices. Blake decided that pizzas would be fun. 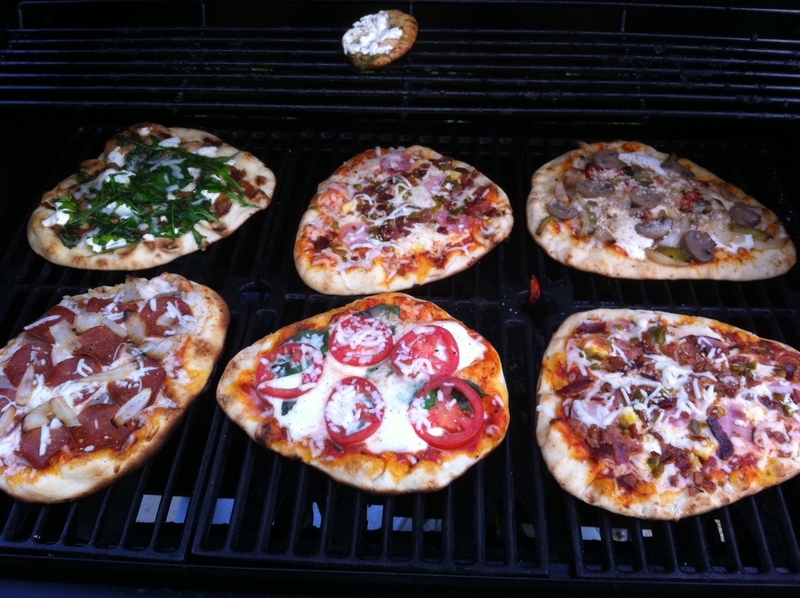 Instantly, I thought pizza stone, rolling dough, expensive, hassle…. Blake proved me wrong. He headed out to Ingles where he found Naan, an Indian flat bread, on sale for about a dollar each. He picked up six of them and we were ready to go. We pulled out all of the cheeses and toppings we could find in the fridge, and created an awesome meal that was quite impressive. Of course, we made enough to share with our friends at the pool and a little more for those we hadn’t yet met. 1. Brush a bit of olive oil on the Naan bread. 2. Top with pizza sauce of choice, olive oil, pesto, or whatever sounds good. 3. Apply toppings and cheese of choice. These can be made ahead of time and wrapped in aluminum foil to make at a later time or assembled right at the grill. 6. Leave lid down as much as possible. 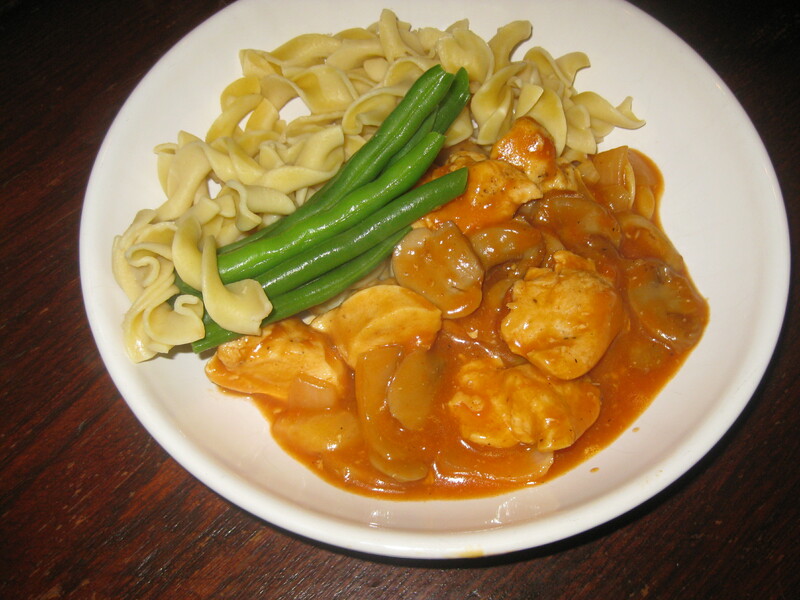 – The list keeps going on and on….. this is an amazing meal to get rid of leftovers or have fun with whatever is in the fridge. I absolutely love when fresh herbs are on sale in the winter. I get so spoiled in the summer with the endless supply of my home grown herbs, that I miss them so much in the winter. Generally they run between $2.00-4.00 for a small bunch of herbs when you buy them at the store. I was at Ingles the other day when I found them Buy One, Get One FREE! I grabbed a pack of sage and a pack of basil. 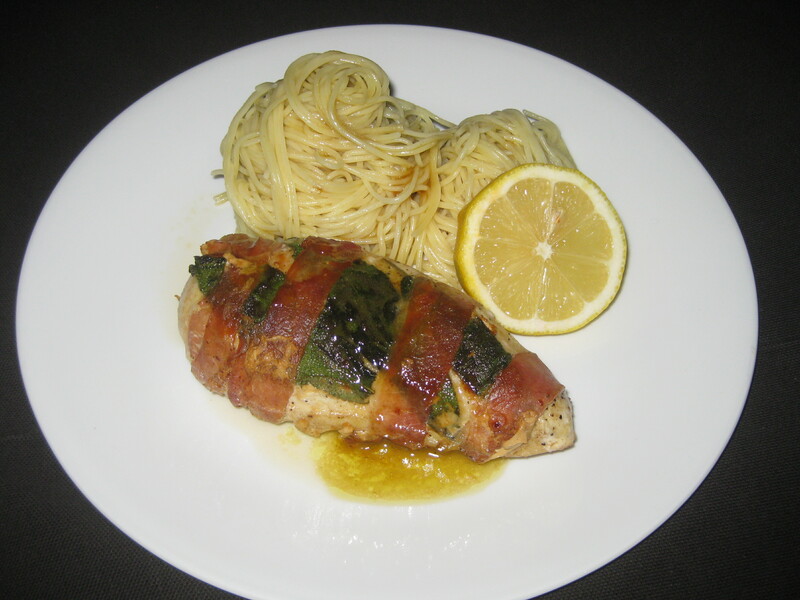 I really like to use sage with chicken whenever I get the chance. I also noticed Boar’s Head prosciutto was on sale for $1.10 off per pound at the Publix deli. I knew that I could make something delightful with these items. I have always been a huge fan of the under-appreciated, yet salty and lean meat, prosciutto. Recently, I have noticed it gaining popularity in the food magazines which makes me very happy. In fact, a prosciutto and egg biscuit graced the cover of Food and Wine in January. Go prosciutto…way to keep up the fight to the top!!! 10. Spoon sauce over chicken and serve with angel hair pasta or polenta. I am not a big fan of casseroles or meals that are all mixed together. For example, I don’t like Chicken and Dumplings or Chicken Pot Pie because each bite tastes the same. I love to have a variety of meat and sides, so I have the ability to transform every bite into a new taste. There are a few exceptions to my stance on this. One is Chicken Merango. My aunt has made this meal for as long as I can remember. My sister-in-law made it last night. It made me think “what a good blog entry!” It is easy to make and it’s delicious. My brother is determined that egg noodles are a must. I was thinking of serving it on rice, but my brother said that would be like eating “Rice-a-cini Alfredo” and no one wants that. 1. Saute the chicken until browned. 2. Pour in both cans of soup. 3. Add garlic powder, onion and mushrooms. 4. Simmer low heat for 30-40 minutes. 5. Do a little Merango Tango and enjoy! Friday Night in the Foster home has become pizza night. Blake and I both make our own pizza, so we have a lot of variety. I never liked pizza until after I had Lottie. Now, I love it. Every time they have the pizza at school, I partake. There is just something I love about the overwhelming dry flour taste that accompanies the school cafeteria pizza. One of my students always makes fun of me because I hate cheese on my pizza. I always scrape it off into the trashcan. 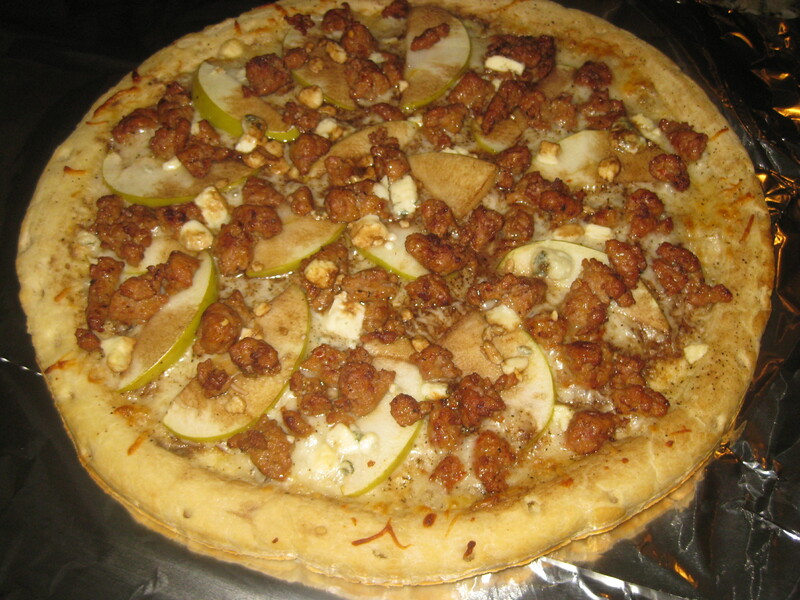 Then I replace the toppings and chow down. 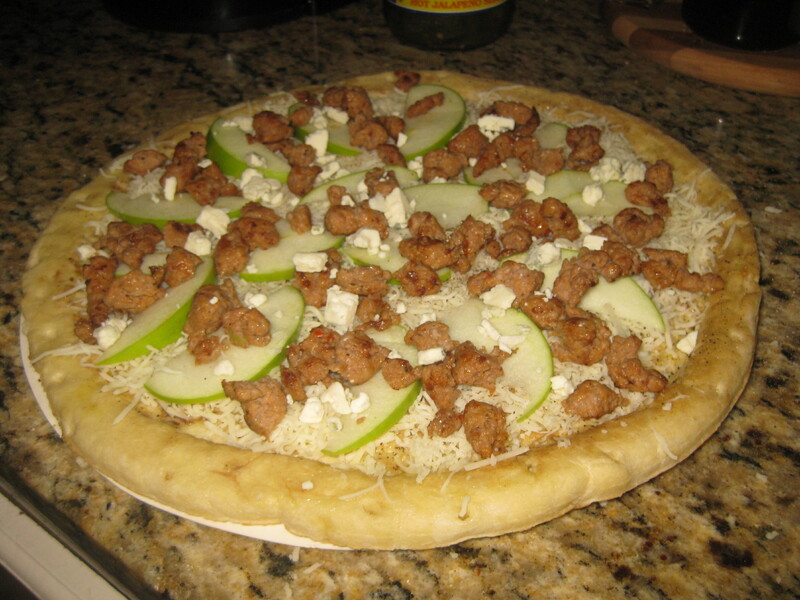 My very favorite pizza that I have made thus far is Granny Smith apple and hot Italian sausage pizza. It is to die for! We like to buy the precooked crust and just add the toppings. Mama Mias from Ingles is similar to the school cafeteria crust. 1. Remove the sausage from the casing and brown in the pan. 2. Reduce 1 cup of Balsamic vinegar by 75% until syrupy and sweet. 8. 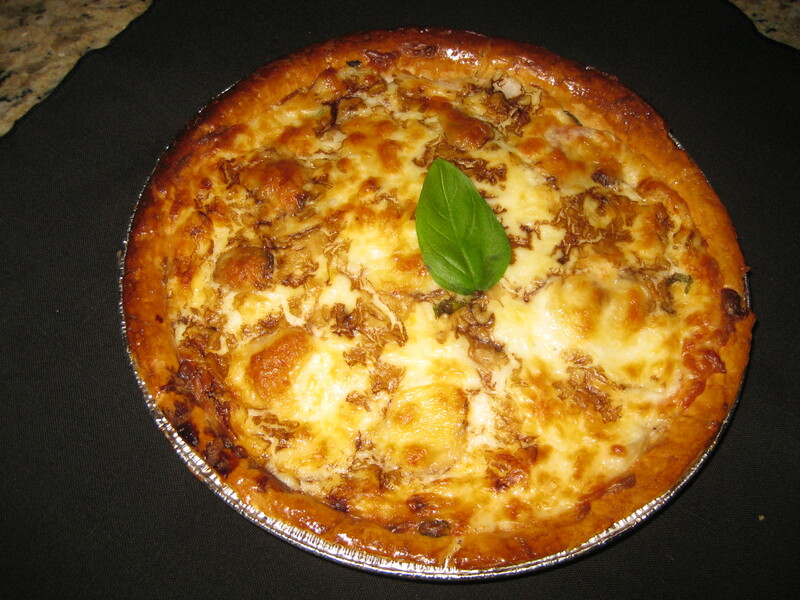 After cooked, drizzle Balsamic reduction on top of pizza and enjoy! I often find myself naming foods based on their shape. It makes sense to me, but at times makes the food sound less appetizing. 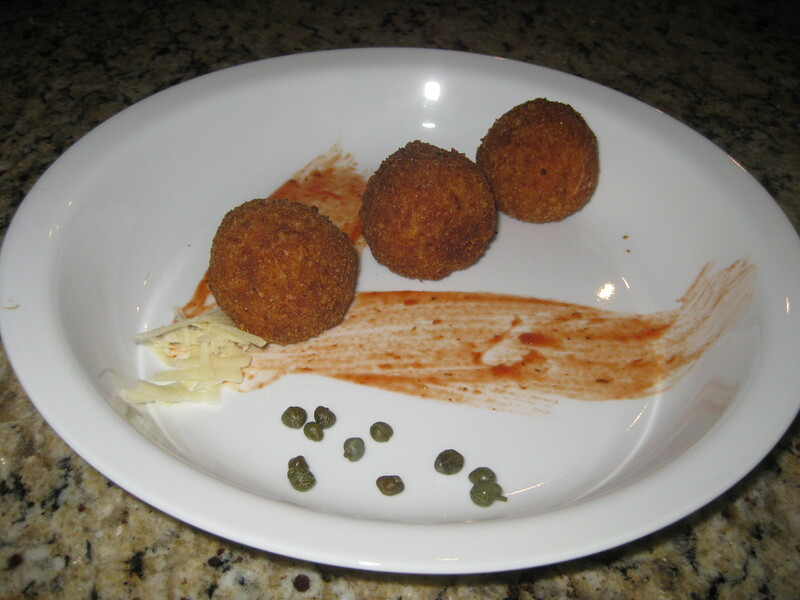 For example, we made “Risotto Balls” before we knew they had a name; Arancini. My best friend, Jenny, and I love Stoney River. We love their “Stoney Balls”. Our favorite bartender of all times , Ken, HATES when we call them that. “They are Stone Pups”, Ken tells us. I guess people like to use words like “pups”, “fritters”, “bites”, etc for things that are round. Where did the love for shape descriptors go? Have fun, and try some variations. Blake loves jalapeno and ham filled Risotto Balls with a pineapple cheddar sauce. You can also make them any shape you want. 1. Heat chicken stock and milk to medium heat in a saucepan. 2. Heat butter and 1 tbsp oil to medium-high heat in a large sauté pan. 3. Add Arborio rice to the butter and oil and stir to evenly coat and roast for 2-3 minutes. most of the broth is absorbed into the rice. rice has soaked it up. 6. After all of the broth is soaked up the rice should be a rich, creamy texture. 7. Remove the rice from heat and place into a large mixing bowl. recipe for a great cheesy risotto ball. and mix together while the mixture is hot. 10. Taste the mixture and season to taste. 12. This mixture can be stored for up to 5 days and used to make Risotto Balls as needed. 13. Heat 3 cups of oil in a medium saucepan to high heat. 15. Beat the eggs and set aside. 18. Place the risotto balls into the hot oil and fry until a dark/golden brown. 19. Serve immediately with heated marinara sauce or sauce of choice. I have mentioned before and I will mention again, I LOVE WHEN READERS COMPLIMENT THE BLOG AND TELL ME WHAT THEY LIKE. One of my dear friends from middle school, Laura, and I reconnected on Facebook. She sent me an email about how she loved the blog. She and her family are gluten and soy free, so Blake and I took it as a challenge to make something that we wanted for dinner, but cater to her family’s diet. If I ever fulfill my dream of being a professional chef, culinary teacher or TV food personality, I will be sure to incorporate the needs of people who have unique diets. I have a best friend, Kelly, who is a vegetarian. She says she loves to read the blog, but doesn’t cook much from it because we always use meat. 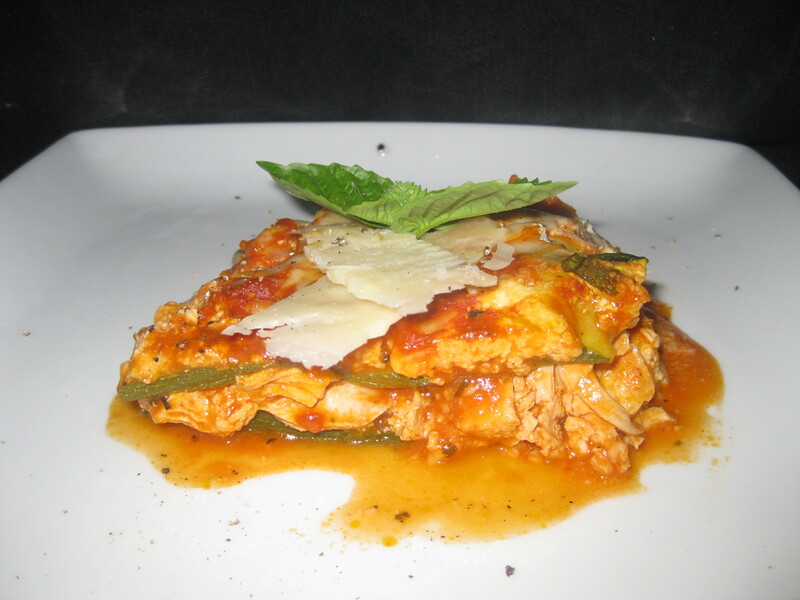 After looking back at our recipes, she was right, and now we are aiming to make more vegetarian-friendly dishes. 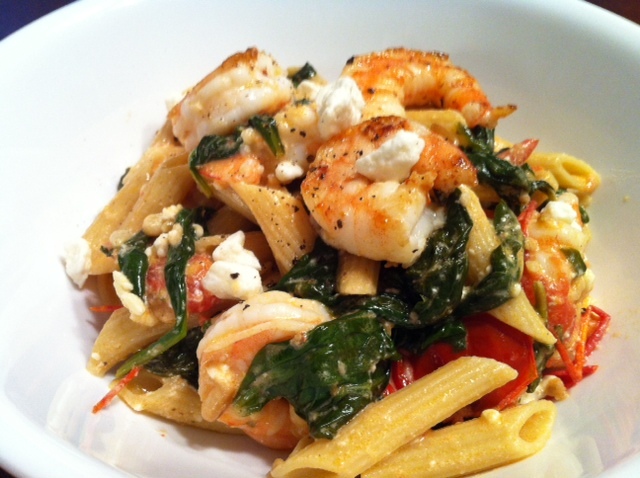 So for all of those of you who are steering away from gluten and/or soy, enjoy this dish! Combine tomato sauce, diced tomatoes, olive oil, minced garlic, 1 tbsp Parmesan cheese and Italian seasoning into a pot and cook on low heat for 30 minutes. (If you are in a hurry, use higher heat). Boil chicken breast for 10 minutes or until cooked through. Shred when cool. Mix together ricotta, basil, thyme, ¼ cup mozzarella cheese, 1 tbsp Parmesan cheese and salt and pepper in a bowl. Set aside for assembly. In a 9-inch glass-baking dish, drizzle olive oil in the bottom of the pan. Add thin layer of tomato sauce. Top with ½ sliced zucchini to cover surface of pan. Spread ½ of cheese mixture on top of zucchini. Top with shredded chicken, evenly dispersed. Coat chicken layer with more sauce to ensure it doesn’t dry out when cooking. Top with remainder of zucchini. Coat with one more layer of tomato sauce. 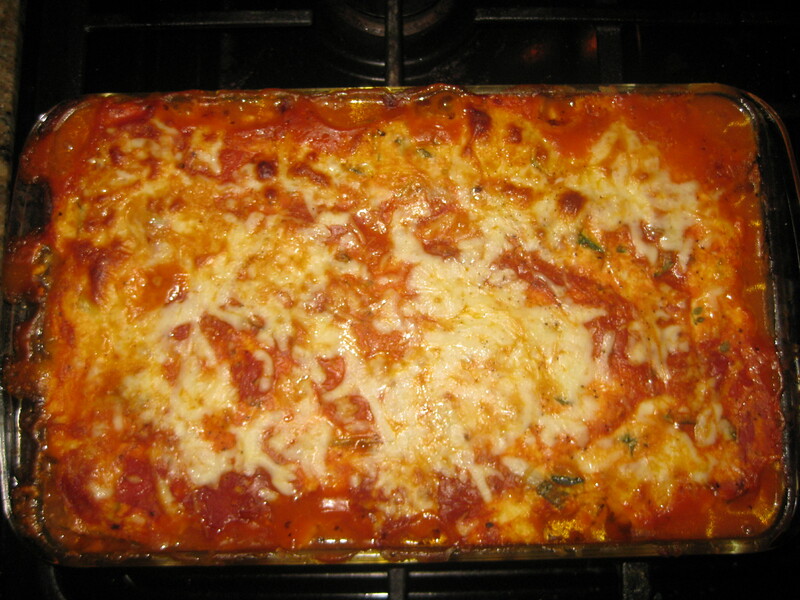 Top with remaining Parmesan and mozzarella. Bake covered with foil for 30 minutes. Uncover and bake at 400 degrees for 20 minutes. Allow 20-30 minutes for “lasagna” to set. Growing up in the South, my meals included mayonnaise, butter, cream, buttermilk, fried flour and/ white gravy. Since I left home as a teenager, I have changed my diet to represent culture and essence of southern cooking, but with a healthier (much healthier) spin on the classic dishes. 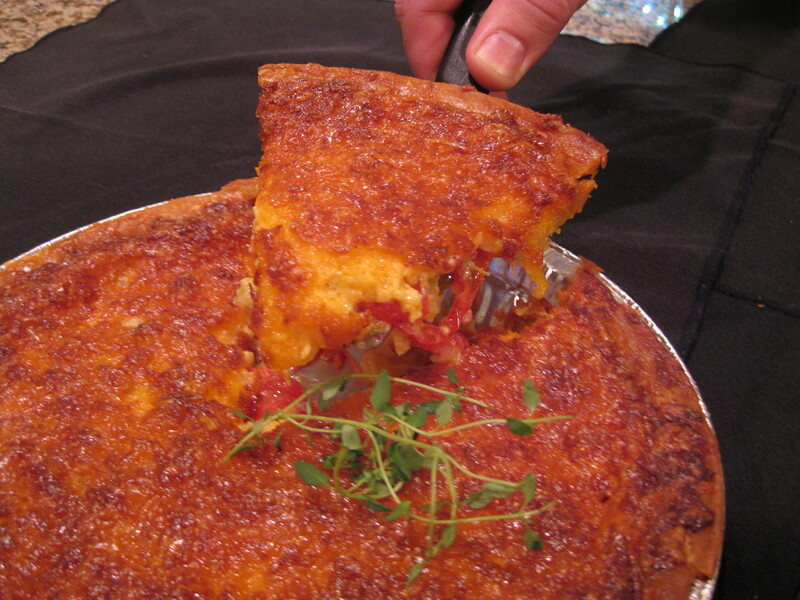 I think this summer I decided that Tomato Pie has moved into my top 10 All Time Favorite Foods. Since we have had a plethora of tomatoes this summer, I was experimenting with new ways to uses them so they wouldn’t go to waste. When I saw Buy One, Get One Free piecrusts on www.southernsavers.com, I knew just what I wanted. I clipped three of the buy one get one free coupons for piecrusts, so I knew I had some room to experiment with modernizing a southern Tomato Pie. Since the Southern traditional one is always a hit at dinner parties and family gathering, I am going to include that recipe too. Baste rim of piecrust with egg white prior to baking to make it brown better. Bake crust 5 minutes at 425 degrees. Combine salt, pepper, basil and onions. 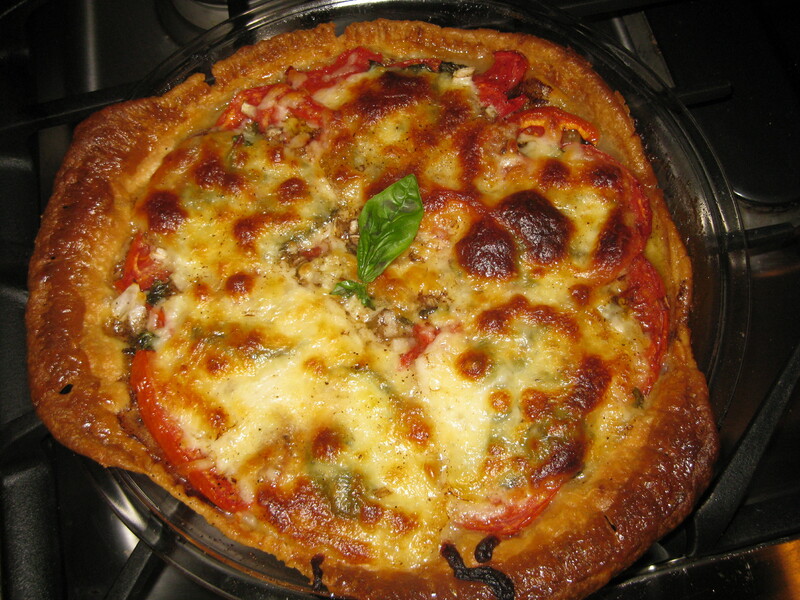 Place seeded tomatoes in crust to cover the bottom. Spread onion mixture over tomatoes. In a mixing bowl, mix cheese and mayonnaise and spread over tomatoes. Bake for 35 minutes at 400 degrees. Allow pie to cool/set before cutting and serving. Combine salt, pepper, and onions.